Nothing is better than a tender, juicy baked chicken served on a chilling day. All the flavours or fragrance were trapped inside the parcel and imparted into the chicken meat. The key to making tender chicken meat is simply not to over-bake it. The meat will be juicy and tender enough. 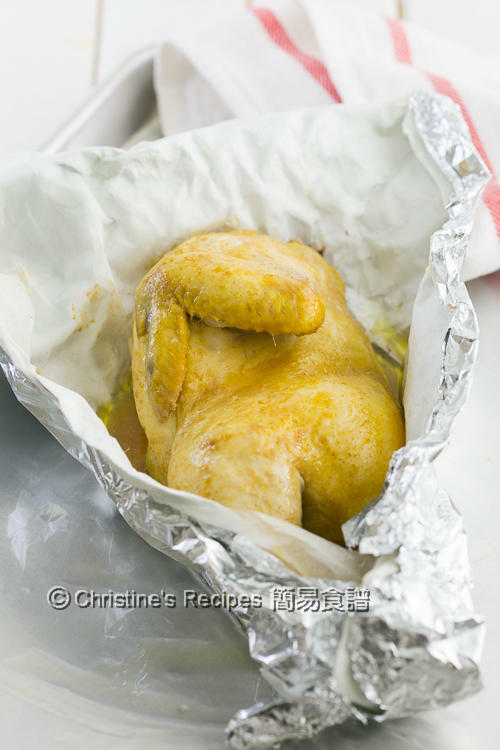 I experimented to bake a half-chicken in a paper parcel. It turned out so amazingly good. Only the simplest seasonings, ginger, spring onion, salt and sand ginger powder (沙薑粉) were used. Oh, please note that sand ginger powder is not ginger powder (picture shown here). They are two different things. Sand ginger powder is a popular spice, often used to make Chinese chicken dishes. This time I used corn-fed chicken with a price a bit higher than a caged chicken. Yet every dollar is worth it. Rinse the chicken. Pat dry with kitchen papers. 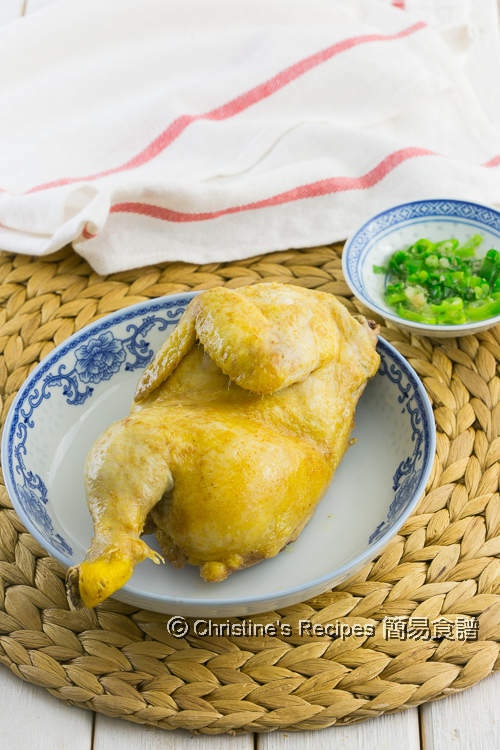 On the chicken cavity side, sprinkle shaoxing wine, ginger juice and season with salt. Let the chicken absorb the seasonings. Turn to the skin side. Rub with salt and sand ginger powder. 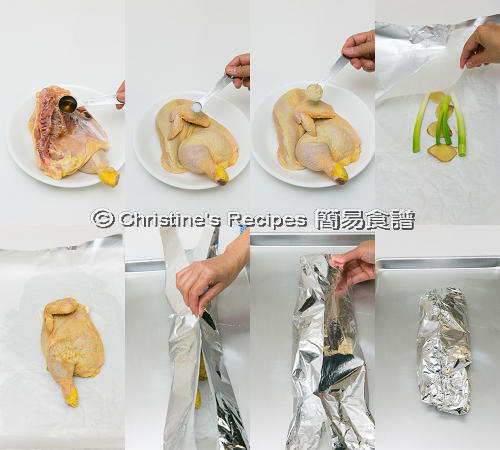 Place a piece of large foil and baking paper on a baking tray. Arrange ginger slices, spring onion. Put chicken on top. Wrap and seal with the foil and baking paper into a parcel. Transfer into the preheated oven and bake for about 50 minutes, or until cooked through. Test the thickest part with a thermometer, it should register at least 75C/ 165F. It’s done. Rest the chicken for 5 minutes. Serve with ginger and spring onion (scallion) oil if desired. Put grated ginger and diced spring onion in a small bowl. Heat 2 to 3 tablespoons of oil in a small sauce pan oven medium high heat. When oil starts to smoke, immediately drizzle on the grated ginger and diced spring onion. It’ll sizzle for a few seconds. Let cool. Season with salt, or soy sauce to your liking. It’s a traditional Chinese dipping sauce for steamed chicken. I found it’s also perfect for this baked chicken dish. According to the instructions from Hong Kong Center for Food Safety, The center of the thickest part of a cooked chicken should reach at least 75C / 165F, whereas Australian government recommends at least 74C / 165F. Sand ginger powder is not ginger powder, available at Asian grocers. The chicken must be very tender and juicy prepared this way. Delicious!